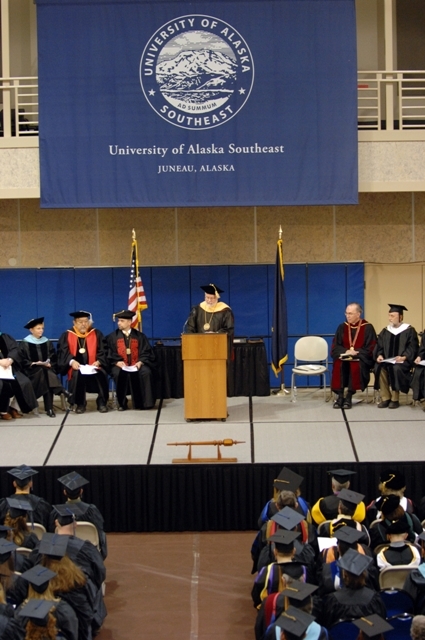 UAS Juneau will honor 2018-2019 graduates on Sunday, May 5, 2019 at 2 p.m. in the Student Recreation Center. There is limited parking available at the Student Recreation Center, there will be a shuttle driving from the main campus parking lot to the Student Recreation Center. Please Note: participating in commencement does not guarantee graduation. Be sure to get your application for graduation in before the posted deadlines. The Native and Rural Student Center will be hosting the Wooch.een Graduation Celebration. Students can participate in both the Wooch.een Celebration and the UAS Juneau Commencement Ceremony. For more information on the Wooch.een Celebration, please contact Kolene James at 907-796-6454. Unable to attend commencement? View the commencement ceremony via our YouTube channel. If you are planning on attending the Graduate Hooding Ceremony in Anchorage please contact Kayti Coonjohn at 907-796-6050 kfcoonjohn@alaska.edu. All family, friends and community members are welcome. For families coming into Juneau from out of town, the Prospector Hotel is offering a special group rate for UAS Commencement. A standard single or double room is $109 subject to availability. You must book your reservation by 4/4/2019. The rate includes complimentary parking and wi-fi. Book today using code uasc2019 at www.prospectorhotel.com or call 907-586-3737. The Travelodge Hotel is offering a special group rate for UAS Commencement, and conveniently located 2.5 miles from UAS. A standard room is $109 subject to availability. You must book your reservation by 4/5/2019. The rate includes complimentary wi-fi. Call 907-789-9700 and ask for the UAS Graduation Group Block. Visit http://www.traveljuneau.com/ for travel planners, tips and suggestions on planning your visit. Candidates for graduation will receive a scroll during the commencement ceremony. Diplomas will be printed after final grades are processed and we have certified that your requirements are complete (approximately 4 weeks after the end of the semester). Students residing in Juneau will receive an email when their diplomas are ready to be picked up from the Registrar's Office (Novatney Building - 2nd Floor). If someone else will be picking up your diploma please let us know via email (uas.graduation@alaska.edu). Be advised that you, or the person authorized to pick up your diploma, will be asked to show a valid government issued or student ID. Students residing outside of Juneau will have their diplomas mailed to the address provided on their graduation application. Professional photos of graduates during commencement will be provided. A gift print complements of UAS Alumni and Friends Association will be sent to the most updated mailing address for each student along with ordering forms for more copies. For inquiries or to update your mailing address please contact the Alumni and Friends Association at 907-796-6569. Masters students must order cap, gown, tassel and hood. All other students must order cap, gown, and tassel.